Ryan, the longest-tenured Seahawk, knows he is in a fight for his football life this training camp. 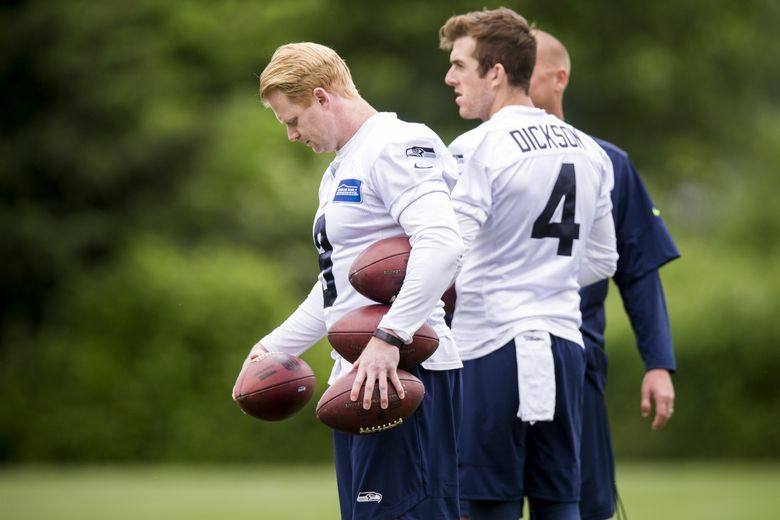 Jon Ryan apologizes for making a reporter wait. But routines must be kept, and on this day, following a morning Seahawks practice, he then headed to a treadmill for an additional 30-minute workout. Ryan’s had these routines since coming to the Seahawks in 2008, which makes him the longest-tenured player on the team and the only one left who predates the arrival of Pete Carroll in 2010. Ryan, though, knows better than anyone that this training camp is unlike any other in his time with the Seahawks. Seattle’s career leader in essentially every significant punting category, Ryan was in a bar in Houston with friends, hanging out a bit before heading to an Astros game as part of an annual trip to check out a new baseball stadium, when he saw the Seahawks had moved up in the draft to take Texas punter Michael Dickson in the fifth round, only the seventh time in franchise history Seattle had drafted a punter. “I believe there was a round of Tequila ordered shortly after,’’ Ryan says. Ryan, though, says he actually had an idea all along that the Seahawks might take a punter (he also got a call shortly before the pick from Seattle special teams coach Brian Schneider, who is no relation to John, that it was coming). Ryan is 36 and has two years left on a contract that pays him $5.6 million over the next two seasons with Seattle able to save $5.6 million against the salary cap if he were to be released, according to OvertheCap.com (Dickson would make $480,000 in salary this season if he makes the team as part of a four-year deal paying $2.7 million overall). The Seahawks also had some struggles in special teams down the stretch in 2017, finishing 30th in net punting average. Ryan knew the numbers and what they might mean better than anybody. The drafting of Dickson, though, left a question for Ryan — were the Seahawks going to keep him around to compete? The answer, which he got in conversations he had shortly after the draft with coach Pete Carroll and general manager John Schneider, was yes. Ryan then delivered his own message to Schneider, whom he has known since Schneider helped bring Ryan to Green Bay to start his NFL career in 2006 — the two are so close they work out together every Friday during the regular season. “I told him I love him and he has no need to apologize and one way or the other I was going to make him look stupid,’’ Ryan said. As camp began last week, that remained Ryan’s goal. He’s had no real competition for the punting job since securing it after arriving one game into the 2008 season and usually could spend training camp getting ready for the season. This offseason, he said he did a bit more kicking to come to camp in regular season form. “But at the same time I think I can carry that all the way through,’’ Ryan said. Still, the question remains what Ryan can show the team at this point that he hasn’t the last 10 years, leaving him in some ways regarded mostly as insurance in case Dickson doesn’t pan out. And who replaced Sander in Green Bay? None other than Ryan, plucked out of the Canadian Football League in 2006 to compete with the struggling Sander. Dickson, a former Australian Rules Football player whose experience in that sport allowed him to develop a vast repertoire of kicks, has so far appeared everything the team expected when it comes to punting — he was so prolific at Texas his final season that he became the rare punter to leave school with a year of eligibility remaining. One subtle edge Ryan may have is in a sometimes-overlooked aspect of the position – holding for field goals, which throughout the NFL has essentially become a job for the punter. Ryan — who played receiver at the University of Regina — has been near flawless holding with the Seahawks. Dickson, meanwhile, only held regularly at Texas his final season there last fall. Complicating matters a little further is that the Seahawks have both a left-footed (Sebastian Janikowski) and right-footed (Jason Myers) placekicker competing to take over for the ill-fated Blair Walsh. So most likely, it’ll come down to who punts better. Ryan knows the final images of 2017 weren’t pretty — critical late-season losses against Jacksonville and the Rams were turned in part by long punt returns. Ryan, though, feels those didn’t paint the whole picture noting that until then the Seahawks had their usual kind of net punting numbers. Brian Schneider says Ryan’s plan to come to camp in regular season form has paid off. “He’s really performed as good as he ever has,’’ Schneider said Monday.